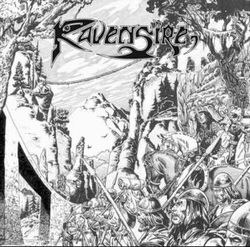 Ravensire is a relatively new band from Portugal that play a rather traditional classic metal with a very old school feel and the usual subject matters of fantasy, warriors, fate, etc etc. Overall the music is solid and strong and the production of the songs is really pretty good. The mix is well done as the flow from one song to the next sounds very crisp. The album artwork is a bit basic, but before you feel that this is a CD to pass on thinking it is a low budget demo feel, definitely give this thing a shot. The songs themselves are very good and these guys really know how to put together a very strong old school feeling album. Songs like Night Of The Beastslayer, Fate Is Inexorable, Iron Pits, Homecoming and Warriors To The Slaughter for example are really strong tracks that stand strongly on their own, and that makes this CD really worth checking out! This Portuguese band has a ton of potential and I am really looking forward to see where they go from here as they can write some very entertaining music!